Nowadays English is such a worldwide language as it is used in many different fields for instance in medicine, politics and many more and it is now considered to be a common language. Teaching English is different all over the world, however I will be focusing on how English is taught in Japan and Sri Lanka. Unfortunately, I have never taught in any other countries apart from Spain so I cannot talk from my personal experience. First and foremost I am going to be talking about Japan, at the moment it seems as though students in Japan are not getting the best marks in their exams. “Junior high and high school students in Japan have failed to meet the government’s targets in all four English skills: reading, listening, writing and speaking.”  One thing that I have to take into consideration is the fact that Japanese and English are completely different from one another from the alphabet to verb tenses and therefore it must be difficult. According to Namiko Abe, nowadays private conversation lessons are very popular due to the fact that students do not seem to be understanding English after years of studying it at school and the demand for English is always increasing . English is taught in Sri Lanka from grade 3 up until grade 13, however, there are still children that leave the school without being able to speak English. Before looking into this topic I was unaware of the fact that Sri Lankan English (SLE) even existed and how much English influenced their language to have their own take on English. Nevertheless, there are some words that are very specific to the UK and/or the US and therefore they are not the most fundamental to learn . Furthermore, it was interesting to read that there are words that are English that do not exist in the English dictionary but are used in Sri Lanka . 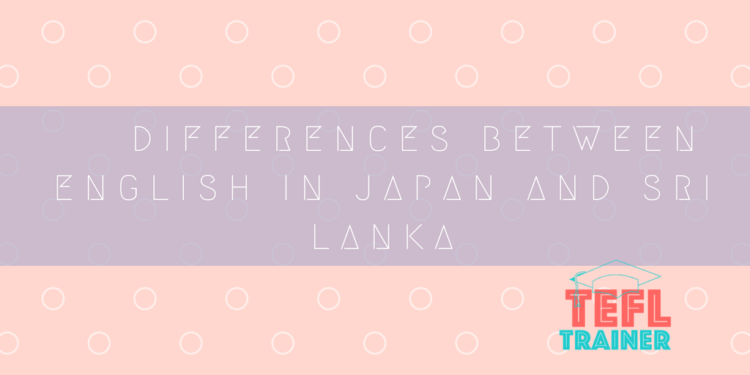 During my time researching I was not able to find out a lot about private English lessons in Sri Lanka, which suggests that private lessons are not really evident in Sri Lanka, whereas in Japan they are becoming increasingly popular. Moreover, it in both countries English it is difficult for the students to learn and there is a lack of understanding, this could be for multiple reasons. Tom C. says: Living in Tokyo (and never having been to Sri Lanka) I would say the answer is because Japanese people don’t have as much of an incentive to learn English as various other Asian countries, where it’s a way to improve their life or get out of poverty, whereas in Japan it’s not that way. Never becoming fluent in English doesn’t really affect Japanese people’s lives if the just plan to live in Japan forever. I’ve met some Sri Lankan college students here though, and I thought their English was pretty good – better than many of my Japanese friends’ English.